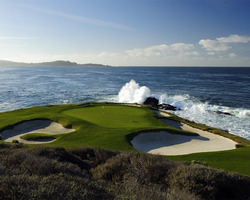 Stay at the Inn at Spanish Bay, and play the #1 rated course in America – Pebble Beach Golf Links! 2+ nights at the Inn at Spanish Bay (Double Occupancy) – Exemplary service & elegance with breathtaking views! Pebble Beach Golf Links – Where golf’s biggest legends have played. Links at Spanish Bay – Natural beauty & authentic recreation of Scotland golf in the USA. Special pricing available with travel between April 1, 2016 through November 15th, 2016. Rates too low to advertise! Call Scott Curry at 888.985.9170 today! Create your own special by starting a custom trip quote to Pebble Beach today!